I was reading in Isaiah today and in my Bible I wrote my name several times in the verse above. 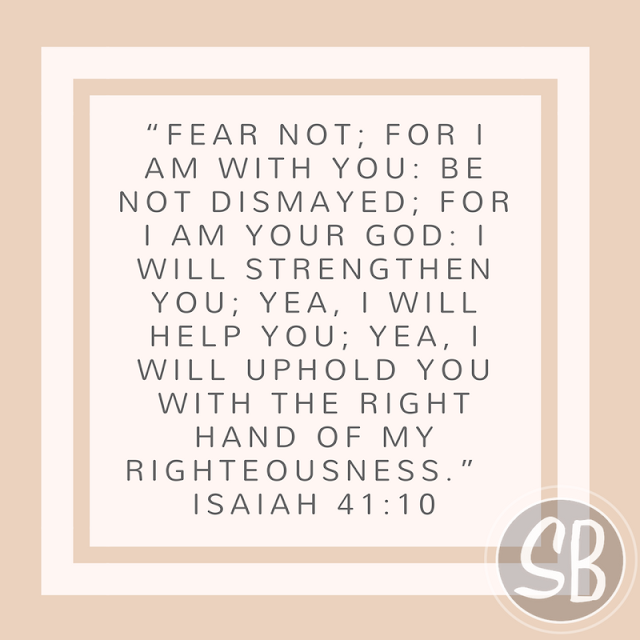 It looked like this: Fear not Lori, for I am with you Lori, be not dismayed (afraid) for I am your God Lori, I will strengthen you Lori, yes, I will help you Lori, I will uphold you with the right hand of my righteousness, Lori! Wow! I read it over and over out loud with my eyes closed, thinking about each statement. Saying my name made it so personal. But, that’s what The Word of God is, our personal love letter from God! So, do not fear anything? Fear not! Don’t be dismayed (afraid)! He says almost the same thing two times. Must be He does not want us to fear! But to trust Him! Do you need strength for anything? He is giving it to you! He WILL help you! He is taking hold of you with His righteous right hand, a hand of justice, of power, of victory, of salvation! “For he has made him, who knew no sin, to be sin for us; that we might be made the righteousness of God in him.” (2 Cor 5:21) Thank you Jesus for making this all possible! For loving us SO much that you came and paid so that we can be made righteous with The Father’s righteousness! Thank you Father for loving us SO much, that you SENT your Son for us!